In this issue of WHOTT Web News we take a brief at Trathens and The Commercial Motors Journey. Trathens - The story of Trathens started back in 1946 when a Dartmoor farmer, Frederick Trathen and his son Eric, carried five people to market on a lorry loaded with his farm produce. The following week seven people turned up for a lift to Plymouth, some thirteen miles away and they travelled on the back of the lorry together with the vegetables and crates of chickens. Over the next few weeks the numbers increased and the two Trathens decided to put wooden seats on the back of the lorry. The trip was so popular that even this was not enough room and so Frederick and Eric bought their first coach. A second-hand 1933 Bedford WLB 20 seater was purchased from the Embankment Motor Co of Plymouth for £100. With this they also ran trips to Torquay and were so successful that they purchased three more second-hand Bedfords. This time they were WTB 25-seaters, two from Greenslades Tours of Exeter in 1948, and one from Regent of Teignmouth in 1949. In 1950 they purchased their first new coach, a Bedford OB with a Mulliner 29-seat body. 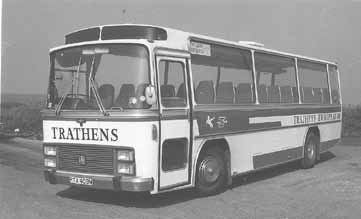 The business grew steadily throughout the ‘fifties and within ten years one new coach was being added to the fleet each year along with second-hand vehicles. In 1960 the Trathens were ready to try their first trip abroad and they ventured to Holland. 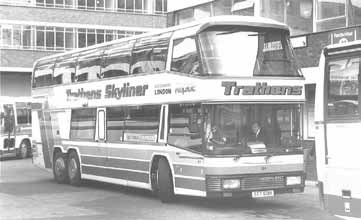 This was the start of the private hire business and many local groups wanted Trathens coaches to take them on holiday. 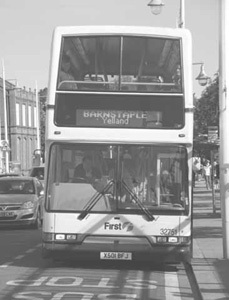 Plymouth Argyle Football Club also used Trathens coaches to take them to league and cup matches. They were immediately impressed with the continental style comfort. By the ‘seventies Trathens were buying three of four new coaches every year and Eric’s sons Mike and David came into the business. In the early eighties the premises previously occupied at Yelverton proved to be far too small and a new headquarters was needed. To fulfill this need, Roborough House on the edge of Dartmoor was purchased and opened for business in October 1982. This twelve acre estate in one of the most beautiful settings of the West Country was formerly the family home of Lord Roborough, who was present at the opening along with the Lord Mayor and Lady Mayoress of Plymouth and five hundred guests. Roborough House proved to be a first class place for people to start their holidays with its airport style departure lounge and a large walled car park for the customers’ cars. Also on the Roborough site was a 1,200 square metre workshop complex. This was designed to specifications laid down by garage manager Albert Taylor, who told the architects exactly what he wanted. It included undercover facilities for ten vehicles, two storey offices and stores, two paint shops, two body preparation bays, five full length inspection pits and a rolling road for brake tests. A staff of twenty manned the garage comprising of electricians, mechanics, coach cleaners and body builders. Trathens also employed a full-time sign writer and service engineers for the videos and televisions fitted to all the coaches. PTA409M – Trathens were a very early user of continental bodywork as can be seen on this 1974 Bedford YRQ with Van Hool bodywork. STT601X – one of Trathens first two Neoplan N122/3 Skyliners for operation on the joint West Country Rapide operation with National Express is seen at Victoria Coach Station. The Commercial Motor Journey - The industry magazine that probably has had the longest run of any on a weekly basis changed ownership last year. Since then a sixmonth intense programme of scanning every page of every available issue was undertaken and for a limited period is freely accessible on the Internet. The search is broken down into decades and then front covers on which one can click to see what they contain. Later on these will only be accessible to magazine subscribers, so for a quick peek into what was going on many years ago, an article in the issue for 13th November 1923 caught our eye. It describes the third and fourth days of a journey by bus from London to Lands End. The ‘adventure’, as they called it, had so far reached Axminster, where the narrative begins. Before proceeding it had to be explained that the author was accompanied by a champion greyhound who performed the greater portion of the entire journey on foot! During the whole of the two days journey from London we had passed through some very beautiful country, but the remainder of the trip through Devonshire and Cornwall and on to Land’s End was expected to supply the most enjoyable part from the scenic point of view. All we need say is that the humble traveller by bus through these two counties, from Axminster to Exeter, Penzance and Land’s End is given an excellent opportunity of obtaining a wide knowledge of the beauties of the West Country, so well chosen are the routes over which the regular services of buses travel. Unfortunately it was raining hard when we started out at 8.30am from Axminster on the first stage of the third day’s run, and although visibility was very poor, the 27-mile journey to Exeter, which occupied 2½ hours, proved very interesting and instructive. The Devon General company’s bus which we boarded was composed of an AEC chassis fitted with a front entrance saloon body, having an iron ladder at the rear to enable the conductor to easily reach the roof to store parcels which he may be called upon to convey. This is undoubtedly an excellent parcel-carrying route, and the arrangements made for the handling and distributing of parcels are most complete. Agents are appointed at all the principal places along the route and they are authorised to accept parcels at their offices for despatch to any place on the route covered by the buses, the goods either being met on the arrival of the bus or being called for at the nearest agents. Parcels can be handed to any agent, to be despatched to another agent, or they can be handed to the conductor of the bus on the line of route. It should be pointed out, however, that parcels are only delivered by the agent within half-a-mile of his office. The scale of charges for this service is as follows: 2lb – 4d; 4lb – 6d; 14lb – 9d; 28lb – 1s; 42lb – 1/3d; 56lb – 1/6d; 70lb – 1/9d; 84lb – 2s; 98lb – 2/3d; 112lb – 2/6d; Ten per cent extra is charged for any distance beyond 25 miles. 32751 (X501BFJ) on Bideford Quay.